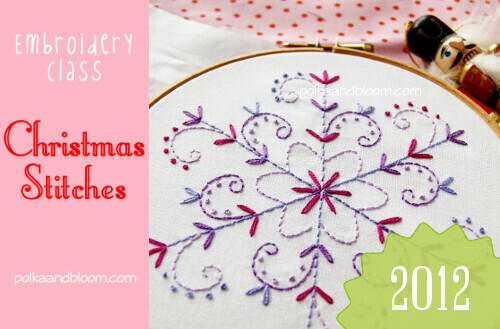 polka & bloom: Christmas Stitches 2012 - sign up now! Christmas Stitches 2012 - sign up now! No, the heat hasn't gone to my head - it's because the Christmas Stitches class is here! I know, you're probably thinking "Christmas?! There's ages until I have to start thinking about Christmas!" But no. Now's the time to start planning and making - especially if you want to make your Christmas presents or decorations. So the class starts on August 20th to give you plenty of time to make things. You can sign up right now, right here. Class starts on August 20th and ends on September 16th. All materials will be available until November 30th. The projects are a combination of embroidery patterns and sewing projects. Beginners are very welcome - all stitches are explained and illustrated. To save 5% sign up between now and August 11th. Enter SNOWMAN at checkout to apply the discount.